Not long to go until our annual Christmas Shopping Fair running from Friday 30th November – Sunday 2nd December! Is there car parking at the event? We have ample parking on-site which is free of charge to all guests. Please follow the event stewards on arrival who will direct you to a space. Do you have disabled parking facility? Yes, for Blue Badge holders only. Please have your badge clearly on display and the event stewards will direct you to our dedicated disabled parking area. This is on hard standing rather than grass and therefore suitable for wheelchair users. Is the site wheelchair accessible? Yes, there is a mixture of hard standing, small gravel and grass, with ramp access to the event areas and a lift. Please do be aware that our Christmas Shopping Fair is becoming increasingly popular each year. This results in far more footfall throughout the house than we usually experience during our normal visitor attraction opening times and may, therefore, cause some delay and restriction of movement depending on time of day and popularity of the area you are in. When time does the event start? The Christmas Shopping Fair will start at 10am and finish at 4:30pm each day. Is there any public transport? Unfortunately not, we are situated in a rural location there are no bus routes that come close to the event. Do I have to buy my tickets in advance? No, tickets are only available for purchase on the day. Who is exhibiting? If you would like to see who will be exhibiting at the fair, you can view our exhibitors list here. Can I exhibit this year? No, unfortunately the fair is completely full. Our exhibitor list fills up extremely quickly so keep an eye on our website in January for information on how to apply for 2019. I have booked afternoon tea, where do I go? All our afternoon tea bookings will be located in the Carriage Room behind the Stables. The festive afternoon tea is fully booked so unfortunately we cannot take walk ins for this service. Is there a cash machine on site? No, we recommend to bring cash with you as there is no ATM and many exhibitors may not accept card. Is the event suitable for prams? We do have lift access that takes you into the main house, however pram parking is limited. Please do be aware that our Christmas Shopping Fair is becoming increasingly popular each year. This results in far more footfall throughout the house than we usually experience during our normal visitor attraction opening times and may, therefore, cause some delay and restriction of movement depending on time of day and popularity of the area you are in. variety of delicious sandwiches, hot food, drinks. 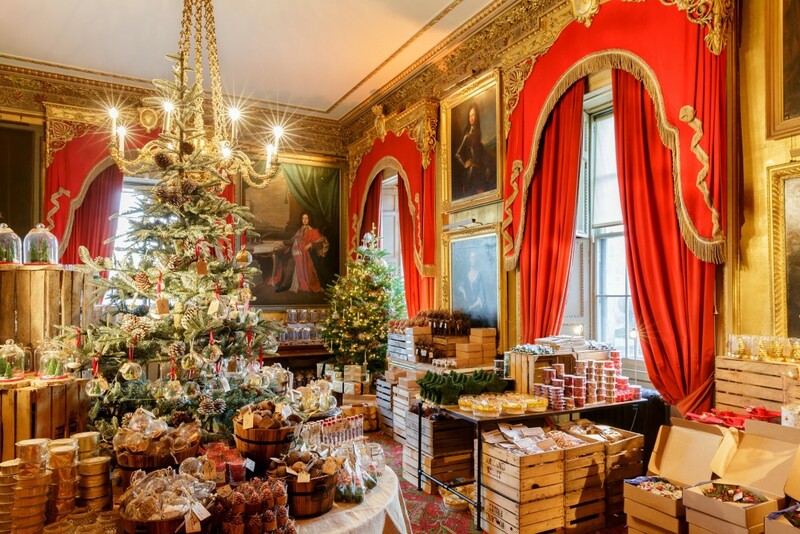 You can also enjoy our outdoor Christmas Food Market which will be open from 11am – 4pm where you can choose from a range of winter warmers to get you into the festive spirit and our specialty cakes and scones!